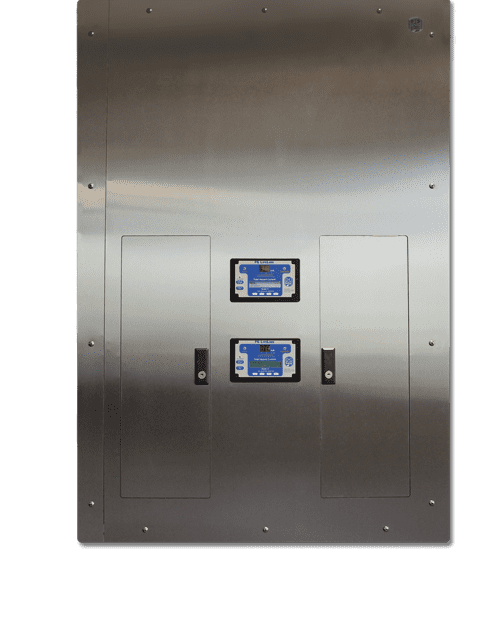 The Enhanced IPD Dual Voltage Isolated Power Panel is a single panel allowing a primary feed to drive two separate output voltages from a single transformer and includes an industry leading 6” back box depth and a concealed hinged front. This configuration provides up to sixteen 120V, 20A circuits for standard line powered equipment and up to two 208 or 240V, 30 or 50A dedicated circuits for laser equipment loads. The IPD Panel is a cost-effective alternative for providing high voltage output without an additional dedicated primary feed. Select from available combinations for high and low voltages (ex. 10kVA at 208V high-side and 7.5kVA at 120V low-side). Each receptacle and equipment grounding connector must be connected back to Reference Ground Bus inside Isolation Panel to maintain Equipotential grounding system. If multiple panels serve the same space, they must be bonded together. See additional panel installation instructions and diagram here.